This is the fourth in a series by Brawlstar skater Just Wingett, continuing each month of 2016 here in the A2D2 blog. Many of us set lofty New Year's resolutions that are forgotten by March. This year, I'm hoping to change that by taking on a different health challenge every month in a series I'm calling "12 Months of Wellness." The health challenges can be cumulative, so that you continue doing the challenge from month one into month two, and months one and two into month three, or you can just focus on each different challenge as it comes along. Either way, I welcome you to join me for a healthier year! In this sixth part of the series, I will be exploring the Whole30 Program. This month marks our halfway point with 12 months of wellness! Woohoo! To celebrate, I’ve chosen a particularly challenging challenge for this month: the Whole30 program. This program involves strict dietary changes for thirty days, aiming not just to make you lose weight or have a single healthy month, but to reset your eating patterns and cravings. The goal is really to change your relationship with food by eating healthy, whole foods with minimal processing. It is very similar to the Paleo diet in that you are focusing on eating vegetables, fruits, nuts, and meat, with no grains, beans, peanuts/legumes, dairy or heavily processed foods. It differs from Paleo in that no added sweeteners are used, not even honey or other natural sweeteners. Whole30 also differs from Paleo in that eating three meals a day is a requirement (again, trying to change the relationship with food) and it is not recommended to create replacement foods from the foods you are allowed to eat. For example, making pizza or pancakes out of fruit and vegetable ingredients would not be recommended. Instead, you want to train your brain to want whole, fresh foods. 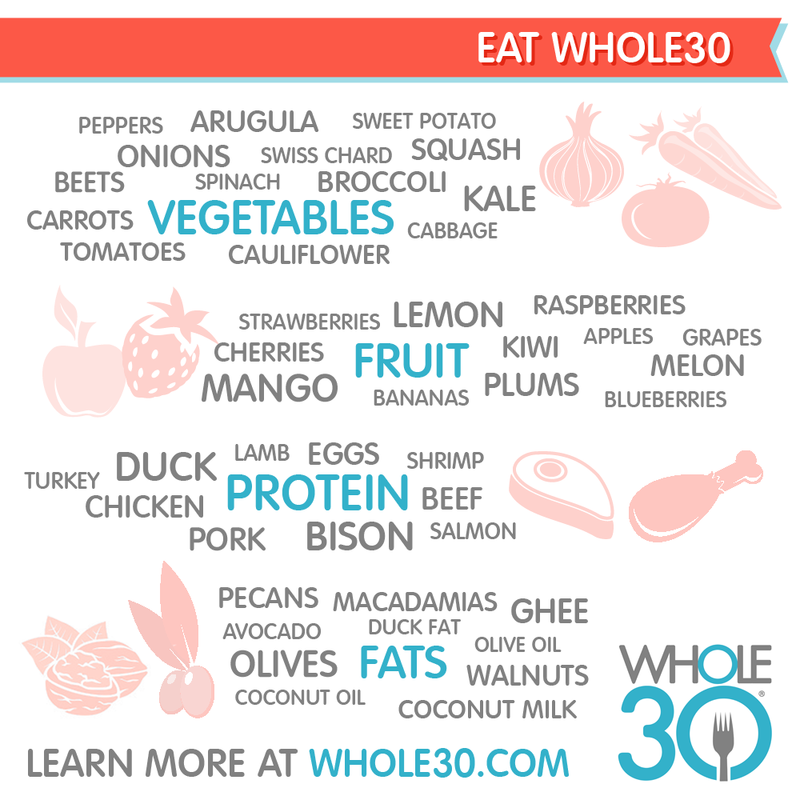 You can read all about the Whole30 program at whole30.com. I interviewed three of my leaguemates who have been doing the Whole30 program for varying lengths of time. At the time of the interview, El Chupa Cobleigh had been on the program for 45 days, Skorpion had been doing it for 27 days, and Infliction Vixen had been doing it for 20 days. Me: What has been the most challenging part of the program for you? Cobleigh: Being mentally exhausted and still having to prepare food has been my downfall. Flic: Well, since I’ve been gluten free for the past 12 years, I was used to a lot of the cooking and leaving out the grains. I thought the hardest part would be drinking my beloved coffee black, but it turns out that wasn't as bad as I thought. I was adding unnecessary calories and sweets in this whole time! So I would say the sweet tooth is the worst. I try to curb it with fruit, but I don't want to eat too much fruit, as that can be bad as well. Skorpion: The first few days not eating any sugar or any kind of bread. I felt kinda nauseous giving up all the sugar but then I started feeling better. I always ate some kind of grain with whatever I was eating, so it was hard to adjust. Me: Have you noticed any benefits since starting Whole30? Skorpion: I feel like it’s easier to focus and my chronic knee pain has improved a lot. Cobleigh: I’m sleeping better! I have sleep apnea and eating Whole30 has helped. I’m also feeling less cloudy-headed. Flic: My pants are fitting more nicely than they used to. I’m feeling less bloated. Me: What do you order when you eat out? Flic: Usually a hamburger with an egg on top and either a plain baked potato or veggies (depending on how hungry I am that day). No bun on the burger of course! Skorpion: I usually get some kind of salad without the cheese. Usually something with avocado and chicken. Me: What is your favorite Whole30 meal to prepare at home? Flic: Salmon with broccoli. Nothing too fancy; I've been keeping it pretty simple with my meals. Skorpion: Baked avocado egg. You take an avocado, cut it in half and remove the pit, crack an egg and put it in the hollow of the avocado. You put it in the oven for 20 minutes at 350 degrees. You can sprinkle chives or bacon on top. It’s super good! Me: Do you think you will be permanently incorporating any of the changes you’ve made to your diet? Skorpion: Mostly giving up grains and dairy. I might veer off occasionally, but I’ll also be watching my sugar intake more and not eating things with added sugar. Cobleigh: Avoiding grains has made a huge difference, and I think I will use Whole30 as lasting guidelines overall. The benefits outshine the hassle for sure. As someone who has struggled with disordered eating much of my life, it's important to remember, though, that food is fuel and slip-ups happen. That doesn't have to derail progress. Avoiding eating because of a mental attachment to the diet is ultimately going to be worse for your body. Me: Any advice for people who are interested in starting this program? Cobleigh: Preparation! Familiarize yourself with fast, palatable options like tuna salad or chia seed pudding. Flic: Planning is the key, and remember, everything is a choice and it's only a month! Thank you to Infliction Vixen, El Chupacobleigh, and Skorpion for participating in this interview. Good luck to them as they continue their Whole30 program, and good luck to you if you choose to follow along at home! Just Wingett is not a doctor, but she is passionate about healthy living and how it relates to roller derby. Posted on June 1, 2016 by Just Wingett and tagged 12 Months of Wellness. This guest post by Scream is the fifth in a series by Brawlstar skater Just Wingett, continuing each month of 2016 here in the A2D2 blog. Many of us set lofty New Year's resolutions that are forgotten by March. This year, I'm hoping to change that by taking on a different health challenge every month in a series I'm calling "12 Months of Wellness." The health challenges can be cumulative, so that you continue doing the challenge from month one into month two, and months one and two into month three, or you can just focus on each different challenge as it comes along. Either way, I welcome you to join me for a healthier year! In this fifth part of the series, Brawlstar skater Strawberries N’ Scream will be doing a guest post about the benefits of reducing meat consumption. People go meatless for a variety of reasons, whether it’s because they want to reduce their carbon footprint or lower their risk for preventable diseases like cardiovascular disease, diabetes, and obesity. It can also help cut down on the weekly grocery budget because beans cost significantly less than meat. Going meatless once a week is a great way to start trying new things. You may have heard of Meatless Mondays, but I instead would like to challenge you to make your next Taco Tuesday meat-free with my favorite taco recipe. Heat oil in medium sized frying pan. Add onion and garlic and cook until onion is translucent. You can also add the jalapeno at this point if you’re using one. Stir in lentils, salsa, taco seasoning, and water. Bring to a simmer and let cook 15-20 minutes until lentils are tender. Stir occasionally and add more water if needed. While Lentils cook chopped up the tomatoes, lettuce and avocado. Heat a smaller frying pan and cook corn tortillas according to package directions. Assemble your tacos as you wish. Thanks for joining us for May’s month of wellness! Will your next taco Tuesday be meat-free? Posted on May 4, 2016 by Scream and tagged 12 Months of Wellness. Many of us set lofty New Year's resolutions that are forgotten by March. This year, I'm hoping to change that by taking on a different health challenge every month in a series I'm calling "12 Months of Wellness." The health challenges can be cumulative, so that you continue doing the challenge from month one into month two, and months one and two into month three, or you can just focus on each different challenge as it comes along. Either way, I welcome you to join me for a healthier year! In this fourth part of the series, I will be focusing on cooking at home versus eating out. Image via The New York Times. Learn more in the story, "Is Junk Food Really Cheaper?". I’m a busy person. I skate for a competitive WFTDA charter team, I co-train our home team, I’m the head of PR and marketing for my league, and that’s only the derby stuff. Add in off skates training, work, school, and a social life, and there’s barely time to breathe, let alone cook. The last few months I’ve been reaching for the take out menu a little too often, despite the fact that I never feel great afterwards. The average American eats out 4-5 times a week. Generally, I try to be a healthy person, but lately I’ve felt more like the average American. It’s been taking a toll on my health AND my wallet. So join me this month as I take out the take-out! For me, this means I am going to cut back to eating out once a week. For you it might mean cutting back from eating out every day to three times a week, or eating out once a month. Choose a goal that works for you, but challenge yourself to eat healthier, save money, and improve your game! The general rule for healthy eating is to choose foods that are high in nutrients and low in calories. Restaurant foods tend to be the exact opposite of this rule. They have more sugar, sodium, and unhealthy trans fats, and contain less water, fiber, and vitamins. Healthy foods, like fruits and vegetables, are naturally full of vitamins, water, and fiber. The excess sodium in restaurant foods coupled with the lack of water can lead to dehydration if you’re only eating prepared foods. Even mild dehydration can cause detrimental effects on athletes, as I talked about in the first monthly challenge. In addition, the lack of necessary nutrients in take-out foods can cause your body to crave more food to get those nutrients, and you may get hungry faster than if you were eating healthy, home cooked meals. Since prepared foods also tend to be higher in calories than what you would make at home, this can lead to weight gain and lethargy, making working out more difficult. The bottom line is eating fast food and take-out all the time will likely end up leaving you dehydrated, feeling crappy, and not living up to your roller derby potential. Roller derby can be expensive, and so can eating out! If I had to choose between playing roller derby and eating out, you would never see me with a take-out menu again. Luckily, I don’t have to make that choice, but reducing my take-out habit will help me save up for skating equipment, workshops, traveling for bouts, and all the other derby spending I do. The average prepared meal costs $13, while a meal cooked at home costs around $4. Packing lunch instead of buying it saves an average of $2000 a year for American workers, enough to fund my derby addiction for the whole year. If you want to save even more while cooking at home, check out Good and Cheap: Eat Well on $4/Day by Leanne Brown, a great free ebook with recipes designed to eat a day’s worth of food for under $4 a day. Armed with all these reasons to step up your cooking, I hope you’ll join me for this month’s challenge! Posted on April 6, 2016 by Just Wingett and tagged 12 Months of Wellness. This is the third in a series by Brawlstar skater Sass Magic, continuing each month of 2016 here in the A2D2 blog. Many of us set lofty New Year's resolutions that are forgotten by March. This year, I'm hoping to change that by taking on a different health challenge every month in a series I'm calling "12 Months of Wellness." The health challenges can be cumulative, so that you continue doing the challenge from month one into month two, and months one and two into month three, or you can just focus on each different challenge as it comes along. Either way, I welcome you to join me for a healthier year! In this third part of the series, I will be focusing on meditation. The word “meditation” often causes people to conjure an image of a Buddhist monk sitting cross legged on top of a mountain, palms up and eyes closed. This is a very limiting concept of meditation! The basic idea of meditation is to clear your mind and stop the mental chatter that is always going on in your head. When you first start meditating, it can be difficult to completely clear your mind, which is why many traditional meditation practices will have you focus on your breathing, or concentrate on a single word or object. Focusing on a specific thing tends to be much easier than clearing the mind completely. However, you don’t need to be sitting cross legged counting your breaths to enjoy the benefits of meditation! Yoga is often used as a moving meditation. Some people use washing the dishes or art, or even petting their cat as a meditation! There are tons of different ways to meditate, and with so many to choose from, there is bound to be something that works for you. The important thing to remember is to clear your mind, let go of the stream of mental chatter, let go of your worries about the past or future, and focus on the present moment. There are many benefits of meditating, ranging from mental, to emotional, to social and physical. In Erlenmeyer Smash’s excellent blog about mental toughness, she talks about how she clears her mind during roller derby practices and games. Meditation can help you build this important skill so that you remain calm and focused during game play. Are you ever worried about the germs you are exposing yourself to during flu season when you and your teammates are rubbing your sweaty bodies all over each other at practice? Meditation has been shown to both increase your immune system function and decrease anxiety. Meditation can help with your creativity and problem solving abilities, making blocking that crafty jammer a breeze! Meditation can also help with your memory and recall. Did you already get that blocker’s point? Is the jammer coming out of the box on her initial pass? What was the score for your last bout? Remember all these important things and more! Better communication is a side effect of meditation, as well as creating more positive social connections, which is vital for this team sport. You may experience an increase in your energy level if you begin meditating. I don’t think any roller derby player would argue with having more energy! This is only the tip of the iceberg. There are dozens of scientifically documented benefits to meditation, all of which can help you gain an edge in your game play. Meditate daily around the same time of day. This will help you build the habit. Start with five minutes (or less for short attention spans) and build up from that to 15-20 minutes or even longer! Pick a meditation style that works for you. If you can’t sit still for five minutes, then try a moving meditation, such as yoga or Qi Gong. Use candles or incense and meditation music to create a relaxing atmosphere when you are first starting. Eventually you should be able to meditate anywhere, but it can be helpful to limit distractions when you are learning to meditate. Turn off your phone. You will survive without it for five minutes. Try meditating with a friend or in a class. Having multiple people meditating with you can increase all that positive energy you’re creating! Good luck on your third month of wellness! Sass Magic is not a doctor, but she is passionate about healthy living and how it relates to roller derby. Posted on March 9, 2016 by Just Wingett and tagged 12 Months of Wellness. This is the second in a series by Brawlstar skater Sass Magic, continuing each month of 2016 here in the A2D2 blog. Many of us set lofty New Year's resolutions that are forgotten by March. This year, I'm hoping to change that by taking on a different health challenge every month in a series I'm calling "12 Months of Wellness." The health challenges can be cumulative, so that you continue doing the challenge from month one into month two, and months one and two into month three, or you can just focus on each different challenge as it comes along. Either way, I welcome you to join me for a healthier year! In this second part of the series, I will be focusing on sugar. White table sugar has been compared to cocaine, not only because of the way it looks, but because of its addictive properties. In laboratory experiments, rats are more motivated by sugar than cocaine, which poses interesting questions for human nutrition. Many experts agree that sugar is powerfully addictive and could be at the heart of the American “obesity epidemic.” The American Heart Association recommends no more than six teaspoons of sugar per day for women and nine for men, while the average American consumes a whopping 22 teaspoons a day. This month, I challenge you to reduce your processed sugar intake, or to cut it out completely. Even just counting how many grams of sugar you are consuming in a day can help you be more aware of what you're putting into your body. Sugar can be found in about 75% of processed foods at the grocery store. Reading the ingredients list isn't always enough, because sugar can be disguised under many different names, such as sucrose, syrup, or anything ending in “ose.” To be sure you're avoiding sugar, just check the nutrition label for how many grams are in a serving. If possible, limit the amount of processed foods you're eating, and don't be fooled by perceived “health” foods. Juices, granola bars, yogurt, and other processed foods marketed as nutritious or healthy can still be chock full of sugar. Natural sweeteners, such as molasses, have more nutritional value than white table sugar, but it is important to remember that a gram of sugar is still a gram of sugar, no matter the origin. Artificial sweeteners have their own detrimental effects on the body, so I would also caution against using those to replace the sugar in your diet. When you taste something sweet, your body prepares insulin for the onslaught of sugar. If no sugar actually accompanies that sweetness, it can leave you with an energy crash and over time, more severe side effects. The best advice I have is, if it tastes sweet, limit how much of it you consume! Because of sugar’s addictive properties, you may experience sugar withdrawals. I started cutting back the sugar in my diet a few months ago, and it took me a couple weeks to adjust. Just remember that you will ultimately be healthier and feel better! I'm looking forward to taking on this challenge with all of you. Posted on February 3, 2016 by Just Wingett and tagged 12 Months of Wellness.